Another successful launch! 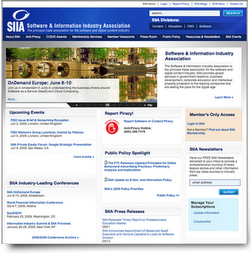 The Software & Information Industry Association launched its redesigned web site last week (SIIA.net). Mediabarn was privileged to have partnered with SIIA to help with the user experience, design and development of the site. The project was definitely a team effort, with Mediabarn joining forces with not only SIIA, but Metisc as well, a Joomla! shop in Australia. Loved the early morning status calls! The new SIIA.net is not only more organized with a cleaner design, but also has a dynamic site structure that can easily be expanded on. Just about all of the site is driven by a single custom Joomla! template. The dynamic nature of the template allows for content blocks, widgets, modules to be easily placed throughout the site with minimal effort. Posted in design, Development, Joomla, launch, studio, What's New. ← IE 8 is fast upon us – NOW WHAT! ?